Hyeon Jung Kim witnessed first hand her family's struggle to establish a sustainable dry cleaning business in Los Angeles that could support the family and provide financial security. The washing, drying, pressing, and labor intensive repetitive processes of the dry cleaning fascinated her but it is a fascination that is clearly a very complex blend of issues. Hyeon is sensitive to the humanity or at times lack thereof in the business, sociological issues and the unacknowledged tolls paid by many. Dry cleaning is a world of sanitizing and removal, the customer with each pick-up of their dry cleaning reconstructing identity with a crisp veneer of freshly pressed shirts, skirts, suits, pants and dresses while machines and the physical repetition of labored hands and chemical processes remains in the back room. Hyeon brings the viewer into the back room. Her work is concise, well-conceived and fabricated with fastidious craftsmanship. The use of materials, juxtaposition of conceptual elements and performative pieces reverberate with a deep sense of meaning and desire to express that captivates. You feel that Hyeon herself would become a machine pressing away if she could to reach a purity between human labor, repetition and her desire to push out the world she sees so clearly. Born in Seoul, South Korea, Hyeon Jung Kim is a first generation immigrant who arrived to the United States as a teenager. She received her MFA degree from Cranbrook Academy of Art in 2013 after completing her BFA degree at the School of the Art Institute of Chicago and studying at the University of London at Goldsmith's College. She has participated in numerous residencies such as the Sculpture Space and Vermont Studio Center and carries a long list of exhibitions, fellowships and awards. Our interview with Hyeon took a few months to come together but her articulate responses and the works shared for the interview were worth every waiting moment. Untitled, Dry Cleaning Tags, Butter Board, 16’’ x 24’’ 2014. Q: You describe that in your own process you are exploring "how the physical object can contain the stresses of everyday life, as well as the public perception of this type of work [dry cleaning]- struggling everyday in a noisy, tight, boiling and filthy environment where workers are forced to complete their repetitive tasks under specific systems". What considerations do you feel you have to take in discussing these issues? A: Growing up, in and around my parents’ dry-cleaning business, my parents, aunts and uncles, and their friends would always talk about working at the cleaners. They would discuss their goals and their strategies of working more efficiently. My approach to this work reflects the ideas internalized from years of listening to my family talk of their dry cleaning business at the dinner table. The actions I take in creating each project applies the same principles of repetition and efficiency that my parents ruminated upon. Q: What are some of the technical aspects to your work and material choices that you want viewers to know? A: I mostly use found objects, all having to do with jobs requiring menial labor. 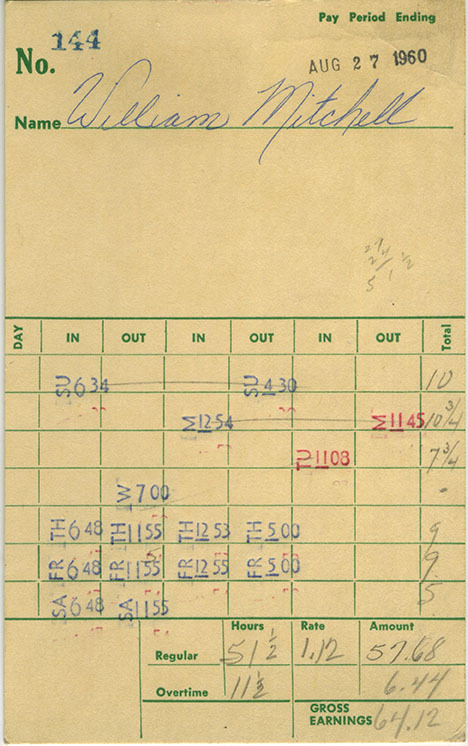 I have used time cards that were last used in 1957. The laundry basket I utilized in my mobile piece belonged to my father, who used if for more than ten years. Sometimes my parents collect materials for me. The materials that I have used thus far have all focused on the various aspects of labor and laborers. Because I use different materials for different projects, I do not have specific techniques for my work. I like to think that the processes and techniques that I use with each specific material are organically derived from the material itself, rather than trying to apply a specific technique to different types of materials that I have on hand. Dropped Off, Not Picked Up, Found Objects; Shirts, 22’’ x 23’’ x 5’’, 2010. Q: Every artist refines their work through a process of discovery and critique. You have deeply invested yourself into environments that enable that discussion and process. Looking back, what project or experience do you now see as a defining moment for the development of your work to this point? A: One day, I was helping my parents at the cleaners, and I looked at the ceiling, I saw rails for the clothes, and clothes hanging from the rails, and it gave me a feeling that I was in a maze. So I collected about 800 men’s button-up shirts and drove to Nebraska City for a residency at Kimmel Harding Nelson Center and told the Directors, Jenni and Pat, about the project. They rented an abandoned elementary school just for me. In the elementary school’s round gym, I built the structure of a circular labyrinth, about 25 feet in diameter. I was traveling in the space and putting bags on each shirt while recording my movements from above by a camera mounted on the ceiling. I finished editing the video at Djerassi Resident Artist Program, and with the help of Sepand Shahab, a composer and fellow resident, we added sound elements and completed the video. After the project, I felt that I found my own personal materials to work with and I realized that there are ways to talk about my parents, the workers and labor in a more political way. Reedsburg Woolen Mill, Found Objects; Time Cards, Tags, Dimensions Variable, 2011. Q: In your artist's statement you discuss the multitude of challenges that faced your family in their immigration to the United States and that the family tried several small businesses before landing on a family-run dry cleaning business, all in pursuit of the American Dream. However, you mention the reality of sacrifices on multiple levels to maintain success, profitability and the weighing considerations for the human element in the labor needed for running the business. How would you describe your relationship with labor in the moment of making the work? How do you determine how labor is enacted or processed? Does the term labor have an evolving meaning to the work? A: What is the difference between their labor and mine in light of the fact that we are both working with the same materials in basically the same ways? Conceptually, the labor that goes into the work I produce is very similar, however, it is mimicking their labor. They are interested in economic production, where my goal is cultural production. Even if I succeed in achieving the same financial ends with similar labor and materials, it is not the same. I look at myself as a preserver of evidence from this type of labor. Click to see Rula, video, 2 minute loop, 2012. The term labor, and how I understand labor, has continued evolving since I was young. At that time, labor had a human aspect; it seemed like a meditative practice in nature. Labor was the repetitive motion of my dad’s bristle brush upon the pile of yellowed collared men’s shirts. Later, my understanding of labor became a contest of efficiency. The minute differences of each stroke were scrutinized, and with each motion, my dad, as well as his workers, seemed driven to become mindless machines. This dehumanization not only imprinted on me the idea of the sterilization of the laborers themselves, but of the service they provided. How much of the human element could be removed from these objects, and how much humanity could we remove from the laborers? Q: One of the things that I really admire about your work is the way you use the materials, whether it is ticket stubs, men's shirts, receipts, hangers, irons and so on, with such objectivity and dedication to a high level of craft in how everything is assembled or edited. This creates a factual space with the viewer that leaves a large amount of room for the viewer to consider the materials, or actions in place. It even feels like you are using the idea of weight itself both in the literal sense of balancing such as in your 2013 Mobilepiece with the safety pins and steel or Untitled piece with the balancing shirts, hangers, chains, steel and a cart. But the weight is also in the abundance and accumulation of a material or item, such as the Reedsburg Woolen Mill piece from 2011 or in Dropped Off, Not Picked Up. And lastly, in a very physical sense the operation of the iron and steam machines themselves relays this very physical weight not only through repetition but the single act itself. Can you talk about this? Is it not 'weight' per se and more an element that you place to enforce labor? A: In my work I deal with three types of ‘weight’ - physical weight, visual weight, and symbolic weight. Physical weight is when I hang something from the ceiling or the wall, balance something, or use anything that fights gravity. Visual weight is when I make something using a repetitive process. If I were to compare this type of weight to drawing, the large heavy object of the image would be made with a thick line, while the repetition would be made with many thin marks that accumulate to create textures to balance the heavy line. In my work I use both to have balance in the work. Symbolic weight has to do with the burden of labor. The burden of labor is the burden experienced by workers and small business owners all over the world; the burden upon their families and the heaviness we see in our ragged, tired parents every night, the weight of their family straddled on their shoulder, suffering but complacent likes beasts of burden. Click to see Labyrinth, Video, 30 sec-loop, 2011. Q: What other artist, designer, writer or otherwise do you consider the greatest influence on your work? Q: Who are two peer artists that you feel are making great work? A: Matthew Mazzotta and Kathy Bruce. They are two artists who are real pioneers in their field. Both artists, who work with different types of media, are extraordinary artists who have personally encouraged and motivated me during my career as an artist. Matthew currently teaches at MIT, and I first met him when I was a resident at Vermont Studio Center in 2009. During that time he developed and featured the Park Spark Project, a public art piece that brings together visual art and community planning that transformed dog waste into methane using a publicly fed dog waste digester. I met Kathy during my residency at Sculpture Space in Utica, New York. Kathy’s sculpture installations explore archetypal female forms within the context of environmental issues. These works incorporate allusions to the universal symbol of women as they appear in ancient history and the earliest civilizations and are interpreted and placed in a contemporary public context within Nature.